Eject the VHD over the MS Explorer in Windows 8.1 is straightforward, the process is the same like for a USB flash drive, or DVD, or CD! Please start the the MS Explorer, the fastest way is with the keyboard shortcut [Windows logo] + [E], then select the virtual disk! By a mouse right click on the mounted VHD in Windows 8, a selection menu will appear, here select eject! (Image-1) Eject mounted VHD via MS-Explorer in Windows 8.1! 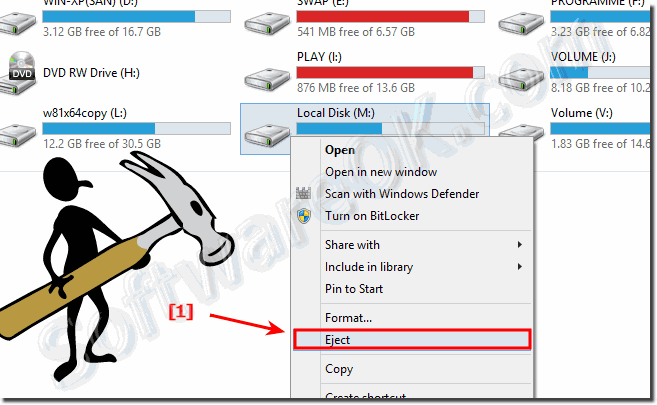 Windows-8 - FAQ-210: The ejection of the VHD over the MS Explorer in Windows 8.1!